When we intended to develop web site to our company, we approached four companies including XSOSYS to gauge who would do the best at reasonable price. The Other three companies queried about lot of things and we felt uncomfortable in making them understand our trade and products. Although the XSOSYS was also anew in this Agro-trade, it quickly came out with the concept, design after we briefly detailed about the trade and the contents. Among the industry players, Motley has now a decent place after the website launched. After the web site keeps going well and witnessing the quality of work, we asked to host the web and email through Xsosys server. We have been with them for the last three years. We do not have any compliant in hosting. Even minor issues have been immediately attended by xsosys well in time. When we get associated with Xsosys, only a few clients were in their band. Recently we cited the Xsosys web-site. Very glad to note that a quite a lot of clients are being their clients including some big and well-reputed companies. When we planned to develop corporate website to our company group with CMS, We approached three different companies in Singapore. XSOSYS impresses us best among three. Because of reasonable price, quick response, dedication and their service quality .At that time we feel KerryITS got an right partner. XSOSYS quickly come out with sitemap, layout design, concept, and dual language system with customized CMS. Their involvement really impress to our corporate team, from that we know our website come up with 100% satisfaction. After the website keeps going well and witnessing the quality of work. Now our website hosted in Xsosys server. And even XSOSYS designed and hosted another similar project named KERRYINTRA. We have been with them close to a year.We don’t have any complaint in hosting and other technical side. Even minor issues arise Xsosys immediately handle our case high priority and fix the issues with in 24 hrs. Xsosys’ service and dedication are very excellent. 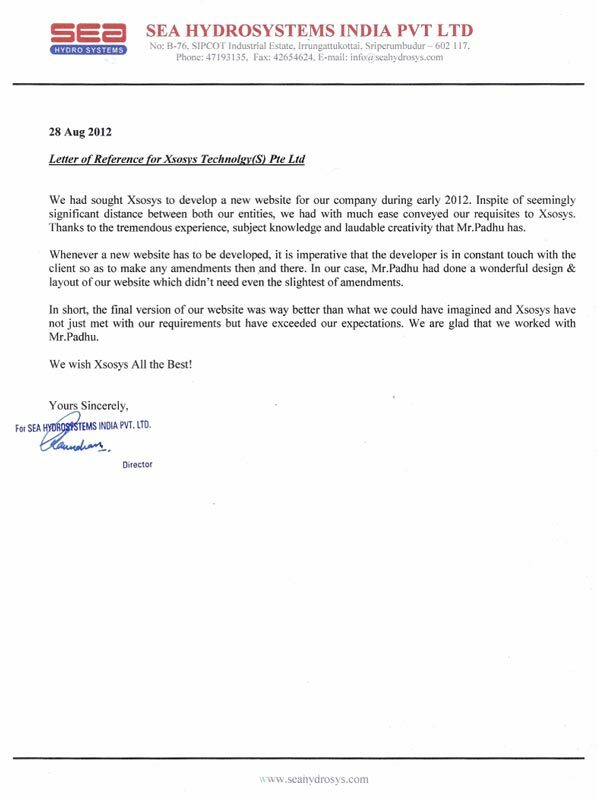 We are pleased to extend and share our experience in using Xsosys Techology (S) Pte Ltd for our Web Solutions. We have received overwhelming responses from all Chapters and managed to achieve close networking success. We considered the services provided by Xsoxys Techology (S) Pte Ltd were excellent with a comprehensive package which allowed us greater access. 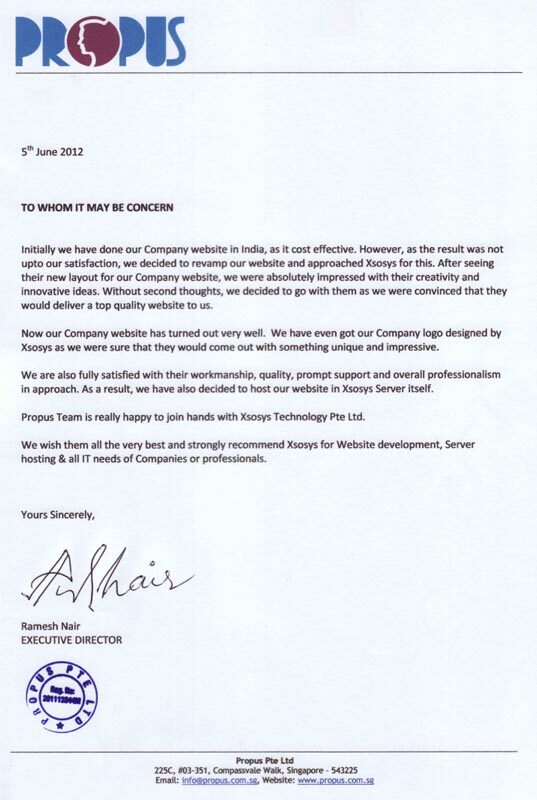 Xsosys Technology hired by us in 2010 for setting up our website and for designing our logo. The end result is an almost perfectly designed website, and an outstanding logo, both of which can be seen at www.renewablewoods.com We would leave the work to talk for itself. 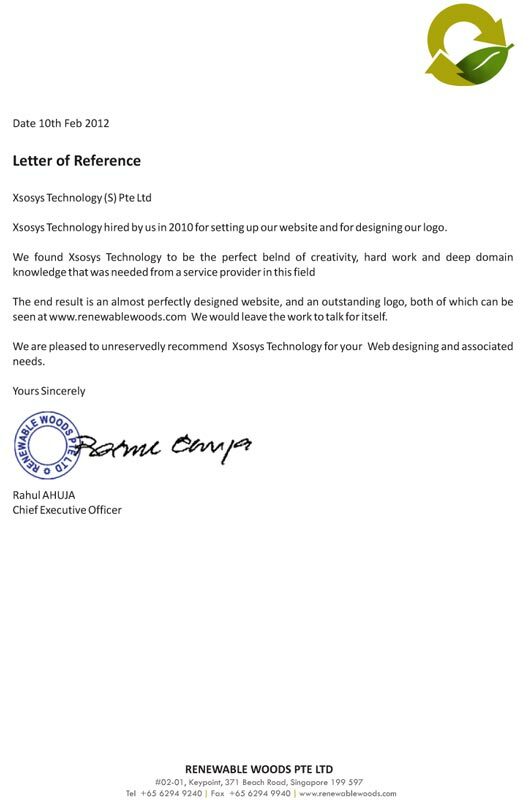 We are pleased to unreservedly recommend Xsosys Technology for your Web designing and associated needs. Mr.Rahul AHUJA - Chief Executive Officer. XSOSYS are truly first in every aspect of the services which they provide. They will give us fully support, when minor issues arise come to answered immediately and issues resolved straight away within fix the issues in 24 hours. The service provided proves to be excellent value for money with providing in reasonable price. We are pleased to recommend XSOSYS to clients and suppliers regularly, recommending for your web designing and associated needs. In order to bring our company closer to the global market, we embarked on a journer to revamp our outdated website last year. As an effective communicator and efficient sales person,Mr.Padhu won us over over despite fierce competition from 4 other reputable web design companies.He set out a detailed plan and guided us in the preparation of the information required for the website for it to be effective.This was helpful as we did not foresee the high volume of information and professional photo shoot required to enhance the overall effect.Despite some hiccups and delays from both ends,we managed to complete the website in Feb 2012 with Xsosys being our website host. We took a chace with a new set up like Xsosys and are glad we did. We wish xsosys all success in their future business dealings. lnitially we have done our Company website in India, as it cost effective However, as the result was not upto our satisfaction, we decided to revamp our website and approached Xsosys for this. After seeing their new layout for our Company website, we were absolutely impressed with their creativity and innovative ideas. Without second thoughts we decided to go with them as we were convinced that they would deliver a top quality website to us. Now our Company website has turned out very well. We have even got our Company logo designed by Xsosys as we were sure that they would come out with something unique and impressive. We are also fully satisfied with their workmanship, quality, prompt support and overall professionalism in approach. As a result, we have also decided to host our website in Xsosys server itself. 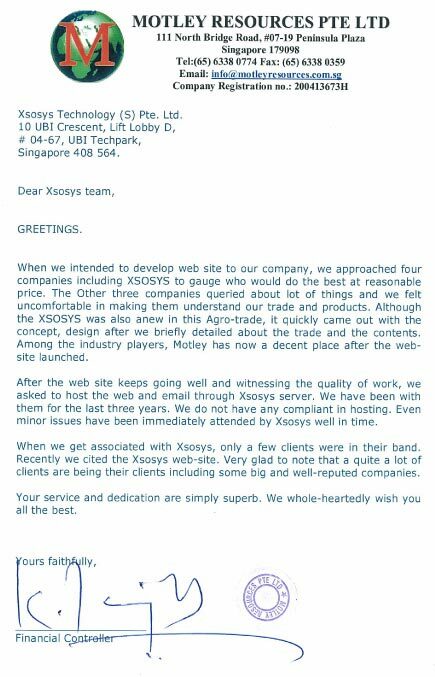 Propus Team is really happy to join hands with Xsosys Technology Pte Ltd.
We wish them all the very best and strongly recommend Xsosys for Website development, Server hosting & all lT needs of Companies or professionals. We had sought Xsosys to develop a new website for our company during early 2012. Inspite of seemingly significant distance between both our entities, we had with much ease conveyed our requisites to Xsosys. Thanks to the tremendous experience, subject knowledge and laudable creativity that Mr.Padhu has. Whenever a new website has to be developed, it is imperative that the developer is in constant touch with the client so as to make any amendments then and there. In our case, Mr.Padhu had done a wonderful design & layout of our website which didn't need even the slightest of amendments. In short, the final version of our website was way better than what we could have imagined and Xsosys have not just met with our requirements but have exceeded our expectations. We are glad that we worked with Mr.Padhu. We wish Xsosys All the Best! I am please to inform Xsosys have created the Universal Peace Foundation Singapore Web site.Xsosys have creatively design the website which looks great wonderful and with spirtual meaning. I strongly witnessing the quality of work and your immediate support with excellent services provided by Xsosys Team. We being hosting the website for the past three years and we do not have any complaint. The members of the universal peace foundation singapore would like to this opportunity to thank xsosys for you sincerer support and Honest Service to Universal Peace Foundation Singapore. With our JEGATHGURU GURUMAHAN MAHA MAHARISHI PARANJOTHIAR's BLESSING. When we intended to re-design our existing website for the company,we approached three companies including XSOSYS to gauge who would do the best at reasonable price.The other two companies queried about a lot of things and we felt uncomfortable in making them understand our trade and products.Although XSOSYS was also a new in this furniture trade and the new and improved website was launched.Not forgetting to mention our sales enquiries went up several percent since the new website was launched. After the website was up and working well,we decided to let XSOSYS host both our web through XSOSYS server as well felt XSOSYS had shown tremendous capabilities in the quality of work and sheer dedication for all the minor issues which was prompty attended to. Your service and dedication are simply outstanding.We sincerely and whole-heartly wish you all the best. 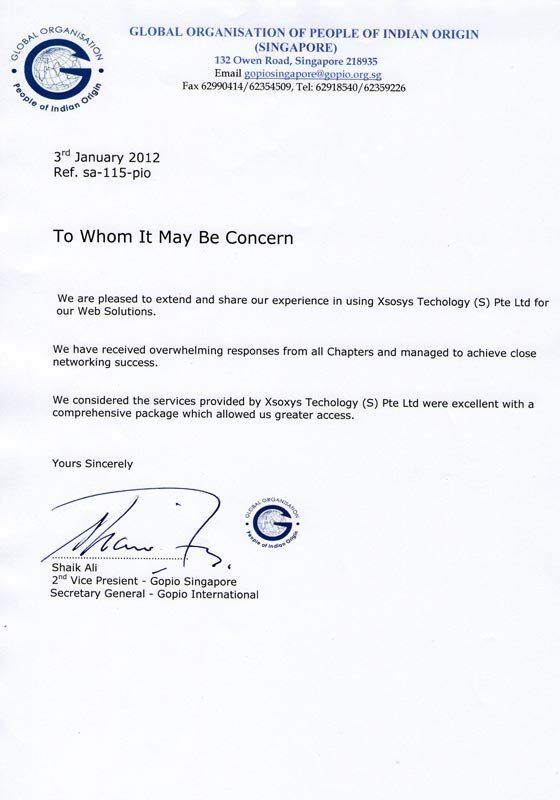 We intend to appreciate the art work,dedication and proffessional ethics of XSOSYS through this reference lettr. We embark on RFQ procedure for our revamp of website to display our intensive and diversified products on cyberspace.This has lead us to XSOSYS who has catered our demand and business requirements professionally and advised us further to encompass its true potential to reach our specific goals. 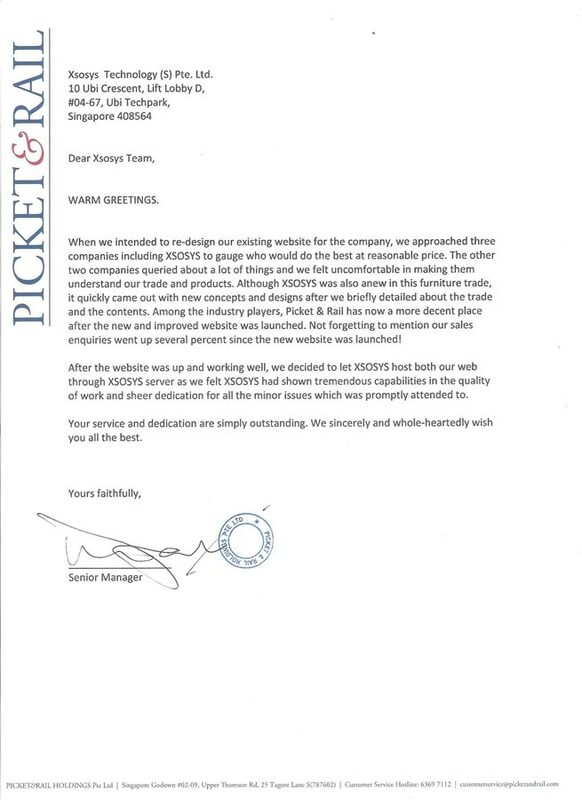 Nevertheless, we awarded this contract to XSOSYS and they have satisfied our requirements to its par.They have added value added contents to further enhance user experience,website aesthetic sense and address diversification of user roles because of our product lines. 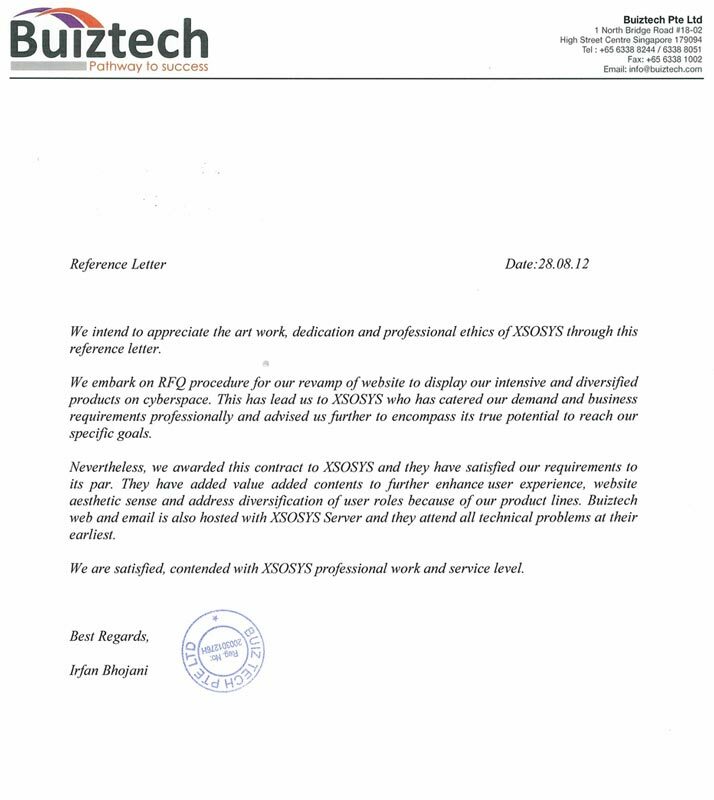 Buiztech web and email is also hosted with XSOSYS server and they attend all technical problems at their earliest. We are satisfied,contended with XSOSYS professional work and service level.